For $500 a week, clients can rent Heather Lombard's Scapegoats herd to help clear off their land. Burnt out from a job as a mental health counselor, fresh off a couple months on the Appalachian Trail, Heather Lombard was looking for a way to get into farming, even though she doesn’t live on a farm. The 36-year-old Kennebunk woman had once trained as a veterinary technician, and had run dog-walking and pet-sitting businesses out of her home, but she wanted something more. She laughed when a friend suggested over coffee last year that she consider goat herding, but the more she thought about it, the more interested she became. She found an article about a group of Massachusetts women who were renting out goats to get rid of brush and invasive species, like jewel weed or multiflora rose or goldenrod, and thought, yes, that’s it, I’m going to get myself a goat herd. After working as an apprentice with the Massachusetts company for a few weeks last fall, Lombard started building up her herd. She bought four Alpines, two Nigerian dwarfs and an Oberhasli. She bought a goat trailer and a portable electric fence, and a very unusual insurance policy that covers possible mishaps such as traffic accidents or damage to a neighbor’s yard caused by escaped goats. 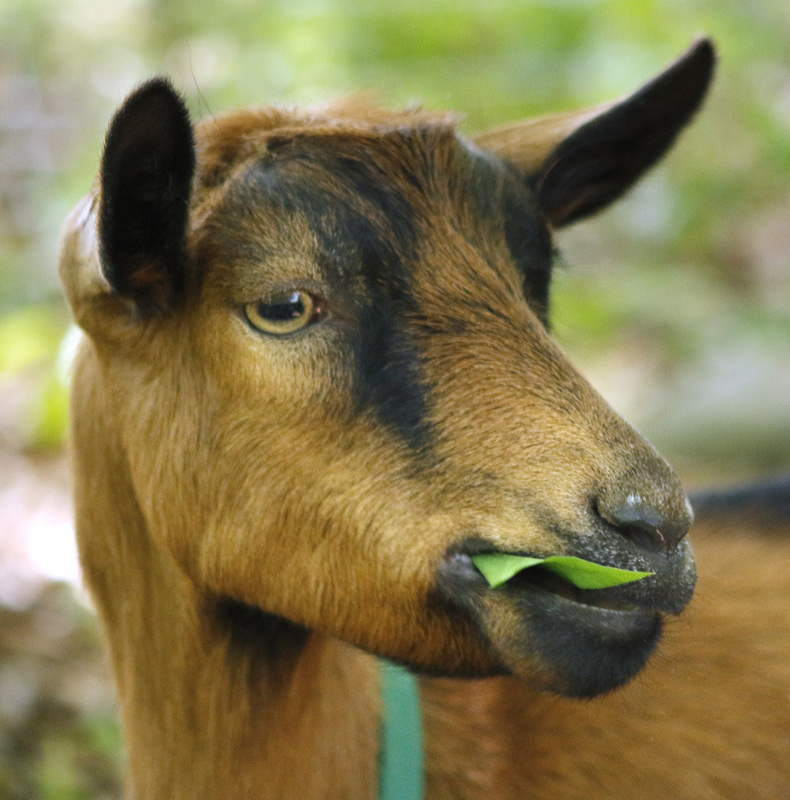 Ray, one of the seven Scapegoats, nibbles on a leaf while working in Kittery. The animals love attention from their host families, but they also run after their owner’s truck when she leaves them at a site. This spring, after raising $1,700 through her online crowdfunding page, Lombard launched Scapegoats. Lombard believes Scapegoats is the first goat-for-hire operation in Maine. That means she has the market to herself, but it also means she spends a lot of time explaining how it works. 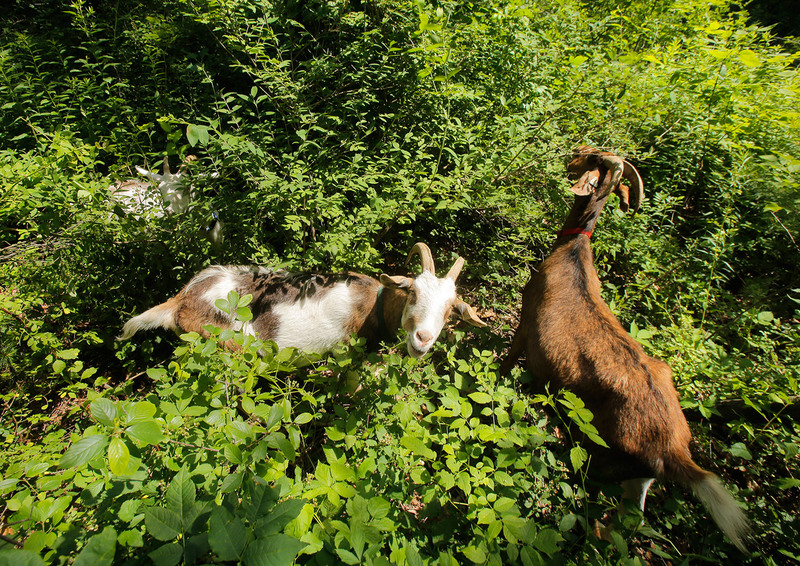 While farmers have always known of goats’ appetite for shrubs and brush, rental businesses like Scapegoats are unusual in New England. The practice, however, is much more common in the West, where so-called “prescribed grazing” employs livestock to clear new pastureland as well as manage vegetation at parks, universities and airports. Goats were used to clear brush at Google’s California headquarters, Lombard notes. Clients can rent the Scapegoats herd – Bernadette, Cleo, Gertrude, Molly, Ray, Sawyer and Zephyr – for $500 a week. They can clear a quarter- to a half-acre a week, depending on the density of the growth. The herd will not trim the unwanted growth right down to the ground – “after all, they’re goats, not lawnmowers,” Lombard said – but they will eat the plants, strip most shrubs down to woody stalks and trample the brush into material that will be a lot easier for a property owner to clip and haul away, saving hours, if not days, of hard labor. Standing in heavy vegetation, Zephyr, center, and Sawyer, right, eat leaves at a home in Kittery, clearing unwanted vegetation. And what they leave behind – goat droppings, deposited about a dozen times a day per goat, trampled into the ground by their hooves – creates a good fertilizer for the homeowner’s next planting, Lombard said. Lombard transports the herd to the property, sets up the fence and goat house, and checks on them every day, but clients have responsibilities, too. They must put out fresh water twice a day and check the voltage of the fence. If the fence needs to be moved during the week, Lombard charges an extra $75. The rest is up to the goats, who tend to work hardest in the early morning and midafternoon, in between short naps. 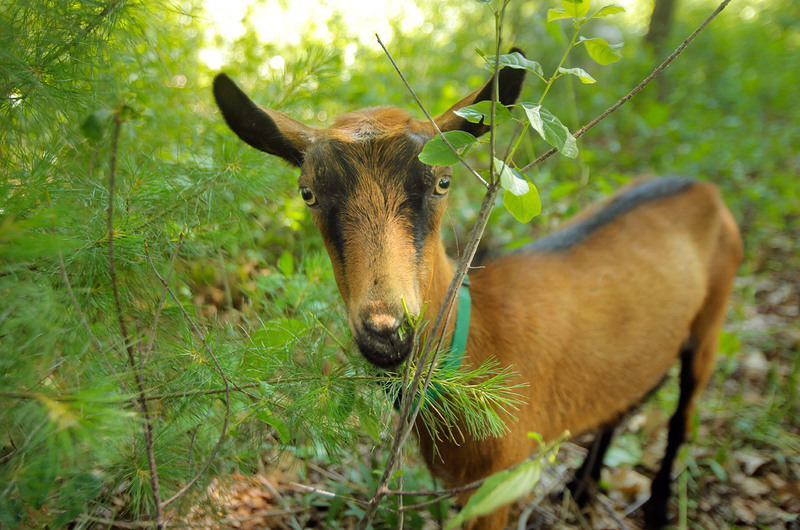 Ray, one of Heather Lombard’s seven goats, eats pine needles from a small tree at a home in Kittery. They love attention from their hosts, especially the children, but they do miss Lombard when she leaves, often chasing after her truck, bleating loudly, as she drives away. While they love most invasives, as well as unwanted plants like poison ivy and oak, they can’t eat everything. Lombard has to turn down jobs where the lots to be cleared have rhododendron, mountain laurel and chokecherry because the goats will eat those plants even though they make them sick. Lombard also has to wrap the trees or shrubs that property owners want to protect in burlap, or install extra fencing, to shield them from the goats’ voracious appetite. The one thing that goats don’t like? Grass. Lombard has fielded a lot of phone inquiries, including several state parks, but has only worked a handful of jobs so far. She wants to stay within a half-hour drive of Kennebunk to conserve fuel, and make it easier to check on the goats, but she has booked a few far-ranging gigs, including a large property in Bath with owners who were just too excited about the goats to turn down. 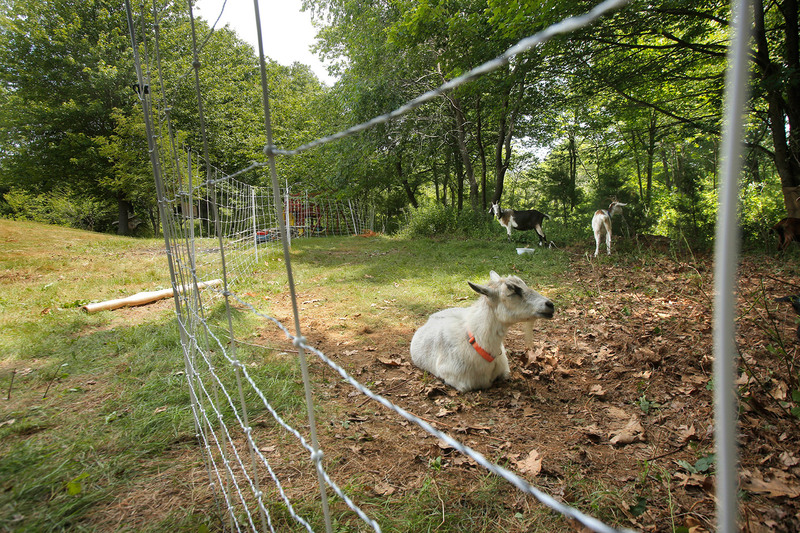 Cleo, a six-year-old goat owned by Heather Lombard, rests in a penned in area at the home in Kittery where Cleo and six other goats were put to work clearing unwanted vegetation last week. She said the interest level has been high enough for her to consider the possibility of doubling her herd for next year, so she can do two jobs at once, but she also will start milking her goats and making goat cheese. 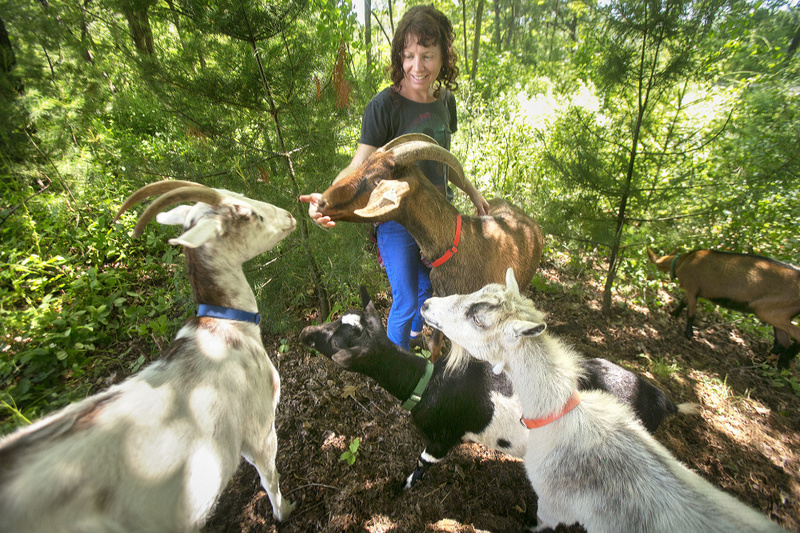 Bethany Moulton is renting out the Scapegoats herd to clear the corner of her 6-acre Kittery lot that is overrun by bittersweet. After hearing about the startup from a friend in Kennebunk, she decided to give it a try, hoping it would be a more environmentally friendly way of solving her problem. Her family already has chickens, and her children have been asking to keep goats, too, so she thought that Scapegoats might let her give the “goat thing” a test run while solving her landscaping problem.